Heart disease, which affects 1 in 3 people, is the leading cause of death for men and women in the United States. Unhealthy behaviors such as smoking or lack of exercise increase the risk of cardiovascular disease. Unfortunately, so does diet. For a healthier heart, recognizing and breaking bad diet habits is a good place to start. Here is a look at five bad diet habits that increase your risk of heart disease. The main cause of heart disease is high blood pressure. When you have a diet high in sodium, the kidneys must work harder to manage the extra amounts in the bloodstream. The body retains water to dilute the sodium as it accumulates. This results in the increase of not only the total fluid surrounding cells, but also the volume of blood found in the bloodstream. The increase of blood volume means extra work for the heart and an increase of pressure on blood vessels. Ultimately, this extra work can stiffen blood vessels, which leads to high blood pressure, heart attack, and heart failure. Heavy alcohol consumption can lead to many problems, some of which put your heart at risk for disease. One common problem for heavy drinkers is high blood pressure. Too much alcohol leads to weight gain because of an increase of calorie intake, which also causes high blood pressure. Consequences of high blood pressure include heat attack and heart failure. Drinking alcohol is best done in moderation. Eating a diet filled with bad fats (trans and saturated fats) leads to heart disease. Trans fat is known for raising LDL (bad) cholesterol and lowering HDL (good) cholesterol. Saturated fat, found in such items as butter, mayo, or sour cream, also raises LDL cholesterol. The increase of LDL cholesterol from bad fats leads to plaque buildup in the arteries, which increases your risk of heart disease or heart attack. It’s a known fact that we all eat too much sugar. Unfortunately, eating an unhealthy amount of sugar on a regular basis leads to an increased risk for high blood pressure and high triglyceride levels, which are both dangerous risk factors for heart disease. When stressed, overwhelmed, or at a weak place emotionally, you might eat food for comfort. This practice is known as emotional eating. When this occurs, food isn’t eaten to satisfy hunger but instead to satisfy emotions. 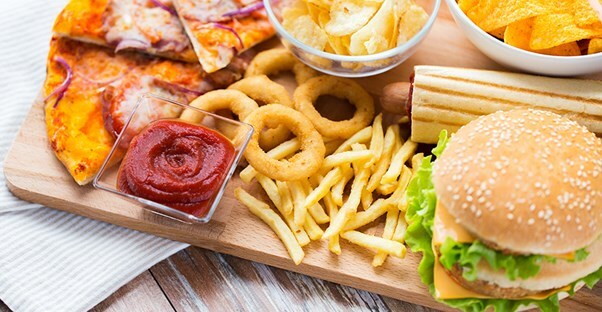 High-fat and high-sugar are types of food craved for comfort. And, as we've already seen, these are two things that can increase your risk of heart disease.